Luxury villa with 5 bedrooms and 4 bathrooms. Fully equipped for 10 to 11 air-conditioned guests in each room with 1 folding bed and 1 baby bed located in Gran Alacant (Santa Pola) with sea view with garden private pool 10M on 4M with outdoor shower large terraces deck chairs charcoal barbecue , summer kitchen with Bar, fridges high stools to take a drink. Comfortable with washing machine, dishwasher, fridge freezer, cable satellite French, English, German, Spanish wi-fi. Mit einer Holzkassette verbringen Sie angenehme Winterabende. . The place is quiet located near the beaches 300m from the supermarket bars restaurants, 5 km from the golf course. A tourist train travels the urbanization Monte y Mar to go to the beach. At 800 meters there is a big shopping center with lots of big supermarket restaurants and also activities for children. One of the features is the mild climate all year long, ideal for enjoying a good part of the year from the beach. The beach is animated by many bars with tourist train that crisscrosses the urbanization. 1) The cleaning fee, linen rental and towels of 215 euros will be paid on the day of arrival. 2) The deposit of 300 euros will be paid on the day of arrival. 3) The electricity consumption at 0,25 euros the kw will be to pay the day of exit. 4) For requests for reservations of less than 7 days there will be a supplement of 85 euros to pay the day of arrival. for reservation requests that remain available between two rentals there will be no surcharge. Bed linen is included in the rental price. 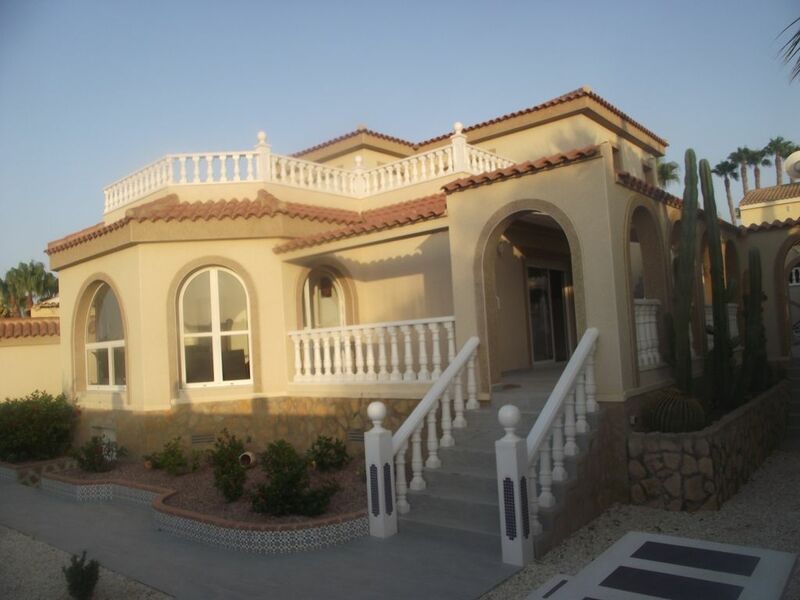 The villa is lovely and very spacious and had all the facilities and equipment you'd expect. The pool is very big and there were lots of inflatables! A nice touch was a range of sun lotions and after sun to use. The location is great with a range of friendly bars and restaurants and large supermarket less than 10 mins walk. Go to Rogers Bar - great breakfast, lovely cocktails and great staff. About 15 mins walk to Lidl and a main shopping area again with bars and restaurants. The beach is quite a distance (around 35 min walk) but there is a tourist train that picks up on the main road which takes you around the area and down to the beach. Contact with the property owner when booking was very efficient and he responds to queries very quickly. Be aware that shops do not open on Sundays which was the day of our arrival so we weren't able to buy supplies like tea, coffee and milk when we arrived and other than a bottle of water in the fridge there wasn't a Welcome Pack. We had to find our bearings very quickly, as there wasn't any local info in the villa like leaflets of things to do and places to go and eat. Other than that, everything was brilliant. We stayed the first week of October so please be mindful it's midges season so if travelling around this time bring insect repellent!! My summary is the villa is lovely, the area was perfect for us, Geoffrey is a great villa owner and we would certainly have no hesitation in booking with him and booking this villa again. Indeed in low season supermarkets are closed on Sundays. In low season they are open from 9:00 until 21:00 in the evening. In high season the supermarkets are open every day Sunday included from 9:00 to 21:30. At the petrol pump "Repzol" there is a small supermarket. To see you again with pleasure! Superb villa with outstanding facilities, quiet location with bars/restaurants only a 10minute walk away. Excellent correspondence from the owner throughout planning our stay.... would absolutely recommend it to family and friends. Already planning our next visit!! We are very happy that you enjoyed our villa. Property had everything needed for a large group . We were three generations 65 - 4 years, and everything inbetween. Great to have AC in each room. This did result in a 140 Euro electricity bill. Local supermarket 5 minutes walk and a couple of bars / restaurants . Bigger shopping area about 10 minutes but getting taxi to return was very difficult. Car not really needed but if we went again would have one just to get shopping. Would have benefitted from some local information about buses etc as there is no tourist information in Gran Alcant. Would defiantly consider using it again. hank you very much for writing an appreciation. arrived as 2 families party of 10. 4 slept upstairs which is accessed via the outside steps both rooms were en suite and led out onto the balcony. We arranged a private transfer from airport through suntransfers which cost 150 pounds return for 10 people return journey. Food shops, there is a dial-a-prix supermarket about a 5 min walk away slightly further is a large lidl. we shopped here on the day of arrival and got a taxi back to the villa which was 4 euros as we had nearly 2 trollies full, lots of heavy bottles. Restaurants - another 2 minute walk from lidl is a small commericial centre if you walk into the centre of it upstairs there are various restaurants - although we never ate here. to the left of the lidl supermarket there is a FAB CHINESE not a buffet but set menus start from 8 euros fpr 10 of us with drinks and a few ice creams it was 113 euros!! just before the chinese there looked to be a lovely small restaurant we unfortunately we didnot discover until the last day. The villa overlooks a main road, there is a market across the road which is a huge. chinese shop not a supermarket. walking left from the villa, the main bus stop on the right you can catch the town train which takes you to various nearby places. the train is 3.50 per adult 2.50 per child it is not a hop on/off train you can only get off at one destination and return from one place as you're ticket is stamped when you get back on. the train from the stop to the left of the villa at the top of the road on the right leaves at 25 past the hour. it takes approx 40 min ride to the beach. if you turn right fro the villa about a 20 minute walk takes you to several bars/restaurants in a small cluster. upstairs a small place called mayka's kitchen again good price and for the 4 adults she provided 4 dishes of spanish food - we left it up to her to choose for us - again reasonable priced. the villa could do with a folder of information in relation to local area etc which i have suggested. the electricity is payable on departure there is no meter to read as such sergio has an electronic reading it cost us 120 euros for the week on departure so do budget for this. we had a few wi-fi issues which geoffrey promptly responded to. he also managed a few questions of my own quickly before departure. As we arrived early we were ble to access the villa on arrival at 1100am which was great. Absolutely stunning property really close to everything you need no need for a car so clean and tidy 6 adults and 4 children enough space for everyone ,could not fault at all we all had a great time probably best holiday ever! !everything went smooth from booking villa ,emailing owner Geoffrey who was a absolutely great owner who always replied promptly to any questions we had and a very fair person !! Landed at airport text Sergio to say we will be arriving in 15 minutes got to villa and there he was kids got straight in to 5 star immaculately kept pool which they needed to as so hot in sunshine!!! So will be booking again no doubt and recommending this villa to everyone I know !!! Once again Geoffrey thanks for your quick replys and understanding with the deposit returning it early so we could all go out for our last meal it was so nice of you ,you didn't have to do that we are all so gratefull of your kindness what a man !!! Thank you so much Geoffrey!! Thank you very much for your message . I am very happy that you enjoyed our villa. When you get to the motorway, exit at Santa Pola, direction Cartagena-Aeropuerto, you get well on the National 332 always take direction Cartagena and about 8km away you arrive in Gran Alacant (Repsol petrol station) and you go up on deck and you get to urbanization. You'll find the restaurant for all tastes, bar, sports field, golf club .It is also a little train that takes you to the beach. There are bus stops to go to the closest cities .You have the city of Alicante with disco, a beautiful boulevard for young and old. She has a busy harbor, nightlife, excellent gastronomy .The port of Santa Pola is located 5 km south, and worth a visit for its agricultural market (Saturday morning), you can also take the ferry to the island Tabarca. The cleaning and laundry fee of 200 euros will be charged on the day of your arrival. The deposit of 300 euros will be payable on the day of your arrival. The electricity consumption at 0.25 euros the kw will be to pay the day of your exit.